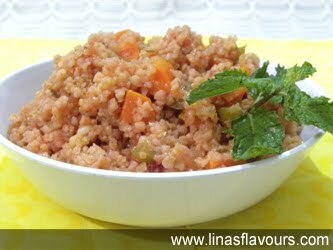 Take a bowl and add bulgar wheat. Add 3 cups of boiling water, salt, close with a lid/dish and keep it aside for 30 minutes. After 30 minutes drain bulger wheat and keep it aside. Take a pan and heat oil. Add onions, ginger-garlic paste and saute it till it turns translucent. Add peas, carrots, salt, chaat masala, beetroot puree, 1 cup water and let it come to the boil. Let it simmer till the vegetables are done. Add bulgar wheat and mix it well. Let it cook on a low flame for about 4-5 minutes. Serve it immediately with curd, raita or soup.